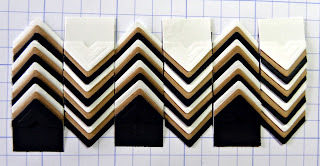 This week at Imaginisce we are teaming up with Scrapbook Adhesive and I am so impressed with their products. 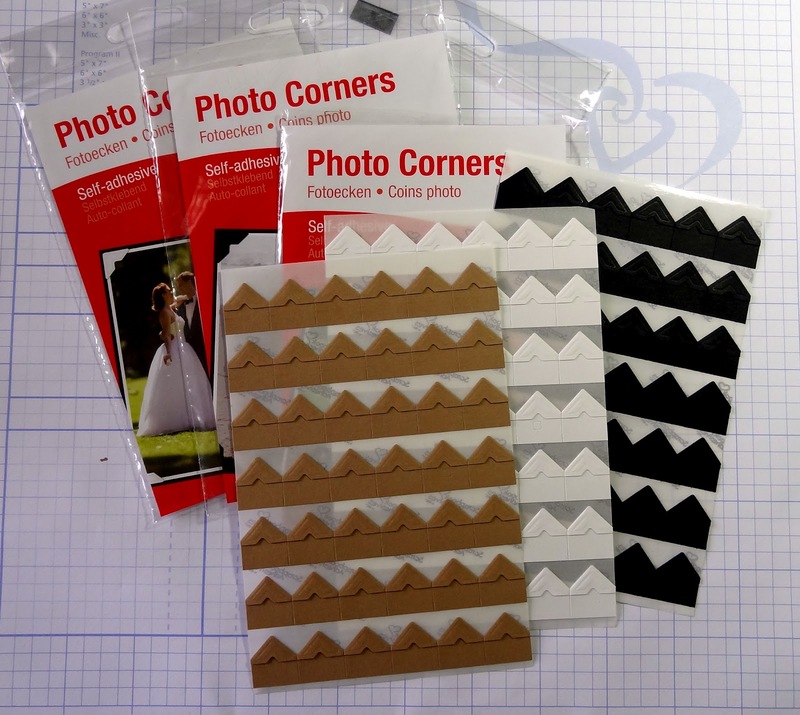 They sent us a ton of great products from photo corners to adhesive sheets to tape runners and more. I couldn't decide what I wanted to do that would best showcase their adhesive so I pulled everything out of their packaging and just stared at them for a few moments in hopes something would hit me. It worked. 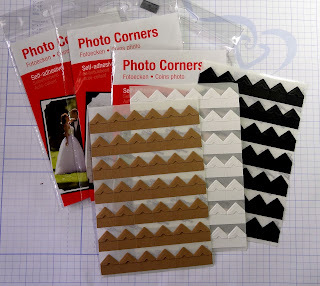 As I was looking at the photo corners sheets, which come 42 on a sheet, I saw a potential pattern. 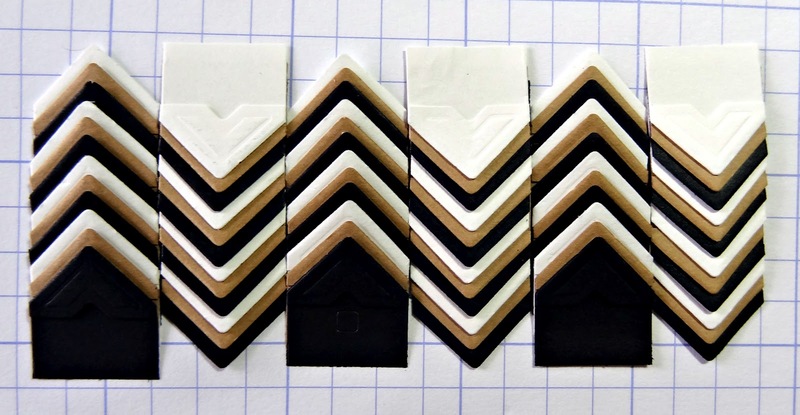 With chevrons being all the rage, I created this cool, dimensional card. This really did happen by pure experiment. Like I said, I saw potential so I started stacking the photo corners on top of each other in a pattern. It took me a few tries to figure out how to position the photo corners to get the look I was going for but once I had it, it was easy peasy. What's cool about these photo corners is that there's a very subtle line that's about an 1/8th of an inch from the top of each side of the photo corner so it made lining/stacking them evenly a breeze. The start of my experiment. See the little indentions that helped me line them up evenly? look like it would not just work but actually look good. I used an entire sheet of each color to make the card. Check out the dimension...and it actually looks very even and cool when looking at the card because the 3 strips that look flat are raised from the top instead of the bottom like the 2 you see below. View from bottom of card. Here's the end result again. I hope you enjoyed my little experiment. Make sure to head over to the Imaginisce blog and leave a comment over there for a chance to win some Scrapbook Adhesive and Imaginisce goodies! wow!!!!! Love the 'flat shot'...you really get the sense of how FAB this is...LOVE LOVE LOVE it! What a cool idea...so creative and gorgeous! So nice to meet you Heather and to work with you with the Paper Issues' Team! You are so smart, girlie!!! :) Love this card and the idea.